It has been an action-packed week. Big Dreamer and I have a new niece. She is sparkly-eyed, with the most beautiful little mouth and chin you’ve ever seen. Oh she’s scrumptious! A hedgehog also briefly took up residence in our garden. One evening last week our next-door neighbours found this hedgehog on their front doorstep, and it just wouldn’t go away. Our doorsteps are not particularly hedgehog-friendly as they are straight out onto the pavement so our neighbours couldn’t work out what was going on. The hedgehog didn’t seem to be injured but it wasn’t very keen on moving on either. At last they took it inside, put it in a cardboard box, gave it some cat food and wondered what on earth to do next. Cue a phone call to us to see if there was room in our hedgehog hotel for it. Now, our hotel has been sadly lacking in hedgehogs after I upset the one that had been living in some old hanging basket liners under a bike tarpaulin (this was last year, in our pre-shed days). It was so offended it didn’t even consider the hotel and we haven’t seen hide nor hair (or should that say prickle?) of it since. 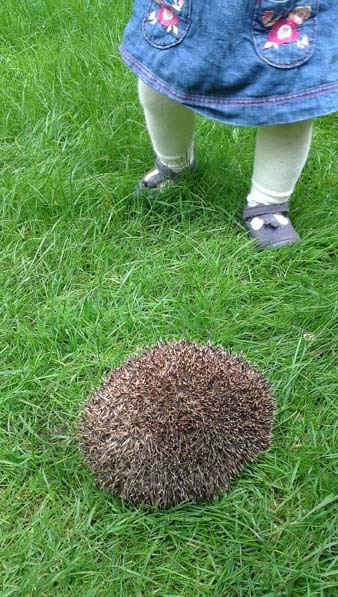 Well, our neighbours brought the hedgehog round and all the children oohed and aahed at it. 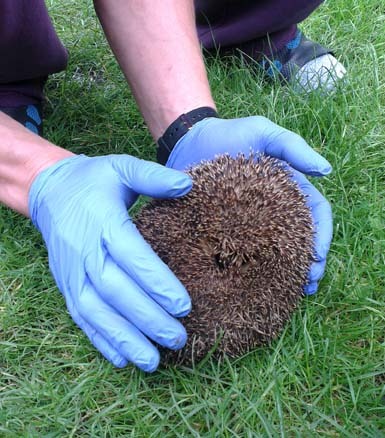 As you can see it was an enormous hedgehog so it didn’t actually fit in the hotel. Fortunately we’d really gone to town last year in trying to woo our prickly friend and had created a whole entire hedgehog village at the bottom of the garden by putting a couple of up-turned, broken plant pots filled with straw around the hotel. The hedgehog fitted inside one of the flowers pots perfectly. It stayed for a couple of days and munched its way through all the cat food we put out. But yesterday morning the cat food was still there and it seems we have been rejected again. Our brilliant neighbour (the one who throws snails into the alley for the blackbird and drives a three-wheeler like a demon) says that she thinks it must have been the female of a pair she has seen round about. The male fell into her garden drain and as he’s only a juvenile, she thinks the female is giving him the run around! We’ll have to see if he can persuade her and perhaps there will be hedgehog babies around here in the spring…and maybe, just maybe they’ll come and live in our hedgehog hotel! Lastly, here’s a pic from the produce tent at a local ploughing match we went to at the weekend. 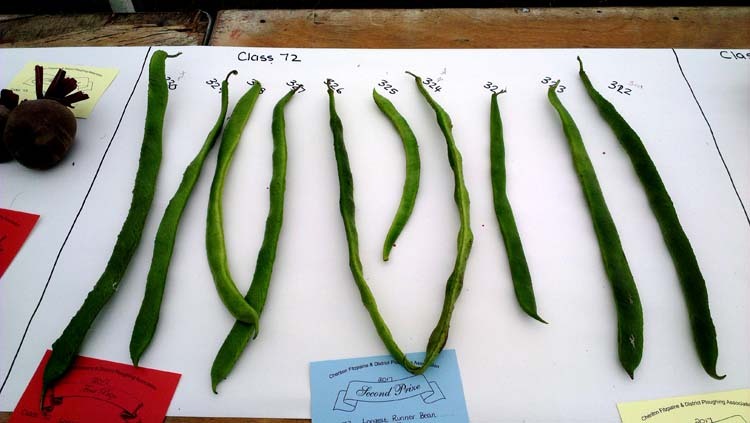 That’s a long runner bean! Wouldn’t fancy eating it mind you! This entry was posted in Countryside, Growing things, Wildlife and tagged blackbird, cat food, children, flower pots, garden, hedgehog, hedgehog hotel, hedgehog house, hedgehog village, longest runner bean, neighbour, new baby, niece, ploughing match, produce show, snails, straw, three-wheeler. Bookmark the permalink. Hope the hotel becomes occupied, our frogs moved on……… I was quietly relieved as the water feature we inherited was rather stagnant & I feared what might lurk beneath sunken bricks. A new shed is planned for next year & hopefully we’ll be butterfly & bee friendly with the bee lodge safely installed. Oh gosh – maybe some terror of the deep! Well done on getting a bee lodge installed – we could do with one of those. Fingers crossed you hog B&B gets filled soon. Thanks Nonna – wouldn’t it be lovely!